Situated in Pacs del Penedes, this property is 1.2 mi (1.9 km) from Torres Winery and within 3 mi (5 km) of Vinseum and Church of Santa Maria. Pinord Winery and Pèlags de Vilobí are also within 3 mi (5 km). 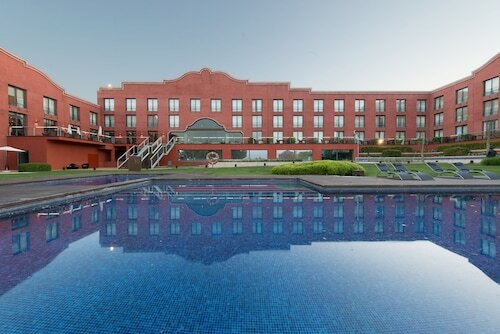 Situated in Molins de Rei, this hotel is 2 mi (3.2 km) from Parc de Collserola and within 9 mi (15 km) of Camp Nou and RCDE Stadium. FC Barcelona Museum and La Masia are also within 9 mi (15 km). Molins de Rei Station is 11 minutes by foot. 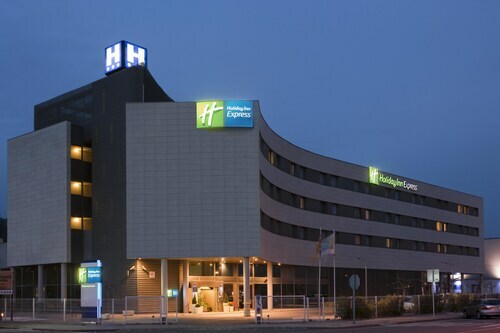 Situated near the airport, this hotel is within 9 mi (15 km) of RCDE Stadium, Placa d'Espanya, and Camp Nou. Poble Espanyol and Fira Barcelona are also within 9 mi (15 km). Barcelona Viladecans Station is 22 minutes by foot. How Much is a Hotel Room in Pacs del Penedes? 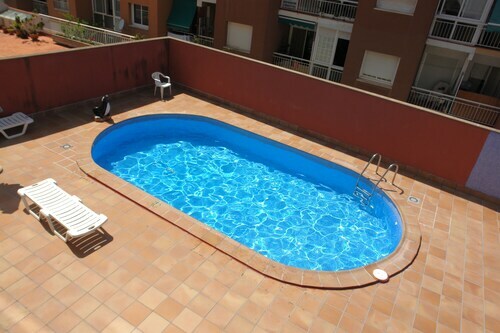 Hotels in Pacs del Penedes start at $38 per night. Prices and availability subject to change. Additional terms may apply. For those wanderers who find themselves roaming through Costa Barcelona and feel like doing a stint in Pacs del Penedes, there are a select variety of hotels, apartments and other accommodation options. Pacs del Penedes has 6 hotels and apartments, all within a 6-mile (10-kilometer) radius of the center of town. Pacs del Penedes's central region is within roaming distance of Travelocity-listed lodgings including Cava & Hotel Mastinell and Sercotel Domo. 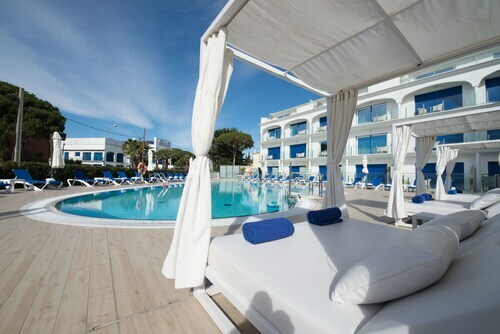 The Le Meridien Ra Beach Hotel & Spa is situated 13 miles (21 kilometers) from the central part of Pacs del Penedes. 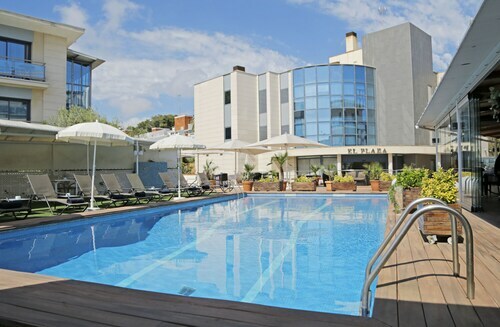 Alternatively, the Hotel Sunway Playa Golf & Spa Sitges is positioned 11 miles (18 kilometers) away. Two other hotel options worth checking out include the Hotel Calipolis as well as the Dolce Sitges. After spending time in in Pacs del Penedes, put aside some time to see the other great attractions Catalonia has to offer. Catalonia is well known for beaches, and other interesting places of interest are ruins. Outdoor-loving travelers might take part in mountain biking in the region. 45 miles (75 kilometers) from Pacs del Penedes, you can reach Caldes d'Estrac, which is home to Palau Foundation and Thermal Baths of Caldes d'Estrac. Next time you head to Caldes d'Estrac, be sure to check out the Hotel Colón Thalasso Termal and Relais du Silence Castell de l'Oliver. 9 miles (15 kilometers) south of Pacs del Penedes, you may also choose to stay at Vilanova I la Geltru, home to the Hotel Solvi - Adults Only and Atenea Park-Suites Apartments. The Vilanova I La Getru Beach and Victor Balaguer Library Museum are other frequented attractions to experience for those visiting Vilanova I la Geltru. Before you head home, why not spend an afternoon enjoying the skills of players with fellow sports fans at an engaging match. Camp Nou can be found 25 miles (38 kilometers) to the east of Pacs del Penedes. If you would like the ease of staying close to the stadium, book a room in the ABaC Restaurant & Hotel or Majestic Residence. Barcelona International Airport is a practical airport for accessing Pacs del Penedes. It is 20 miles (35 kilometers) away. For wise travelers who choose to find a Travelocity-listed base nearby, read about Barcelona Airport Hotel or Hesperia Tower Hotel. Fredrica was excellent, she was always welcoming and helpful. If you are a tourist there is not a lot to do in the area and the property is lacking a fitness room. The hotel is far away from the city. The hotel does not have any ice machine. The hotel does not offer any important information about the city. I arrived in Barcelona the 26th of October and left the property November the 1st. My flight arrived early maybe 30 mins before clock in time at the hotel. The front desk gave me problem following the I asked if i could grab breakfast to which the front desk lady said yes. now the problem with that is i was charged upon my departure. Secondly when i got into the room i ordered 1 queen size bed to which there were two twin beds put together. Third off the second night i was there it rained. As i was using the bathroom the ceiling began to leak. I proceed down stairs to alert someone to which when i spoke to the first desk manager she told me she would have someone come look at the problem. i continue on with my vacation to come back to my room with the same problem. the following day it rains again and now not only is my bathroom ceiling leaking but now the ceiling in the room is leaking as well. I proceed downstairs again to speak with someone for me to be told it would get looked at in the morning. Nothing happened the problems continued. i stayed in the leaking ceiling room til it was time to head back to the states to which the front desk guy asked do i want to change rooms. It was to late at the point and i was over the hotel experience. From the outside, I did not expect to see hard-wood floors, granite countertop in toilet & an above-average accommodation! 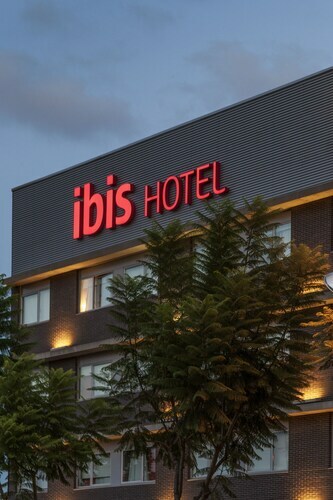 The staff were very helpful, the room had AC, shower had constant hot water supply, elevator convenient for big luggages & most importantly, free breakfast with a variety of food selection. I got a room for 4, & each of my 18 & 22 year-old children had separate beds. Ample space to move about in the room, with fridge to keep drinking water cold. Bus to airport is available across the street & train station is a few blocks of walk away if visiting Barcelona.